why is Vajrayana considered the fastest way to buddhahood? I'm new to Buddhism and exploring various traditions and schools.im wondering If it takes incalculable eons to reach buddhahood through sutra approach what makes it possible to achieve buddhahood in one lifetime through vajrayana methods?why is there such a vast difference in time?seems so extreme. Last edited by Grigoris on Sun May 25, 2014 6:29 pm, edited 1 time in total. Pure Land also speaks of achieving Buddhahood in a way far swifter than the conventional evolution towards enlightenment as explained in the Sutras. In terms of your questions about why Tantra is said to be swift, The Berzin Archives express this more eloquently than I ever could. In general tantra, the obtaining causes for attaining the enlightening body and mind of a Buddha are more analogous to the results we wish to attain. We practice now as if we had already achieved our goals. Because of this feature, tantra, as the “resultant vehicle,” is more efficient for reaching enlightenment. Tantra practice resembles a dress rehearsal. If we wish to dance in a ballet, we need to attend ballet school first and learn to dance. The obtaining cause, however, that functions as the natal source giving rise to the actual performance as its immediate successor, is the dress rehearsal of the ballet. Likewise, if we wish to practice tantra, we need to learn and develop first the essentials from sutra. Subsequent tantra practice is like the dress rehearsal to combine the essentials to bring us to enlightenment as its immediate successor. We do this by imagining that we have all four factors now. Using our imaginations (dmigs-pa) in these ways acts as a cause to achieve the four purified factors more quickly. Most translators call this process “visualization.” The term, however, is a bit misleading, because the process is not merely visual. It involves the entire scope of our imaginations – imagining sights, sounds, smells, tastes, physical sensations, feelings, emotions, actions, and so on. Tantra harnesses the power of imagination – an extremely potent tool we all possess. frank123 wrote: I'm new to Buddhism and exploring various traditions and schools.im wondering If it takes incalculable eons to reach buddhahood through sutra approach what makes it possible to achieve buddhahood in one lifetime through vajrayana methods?why is there such a vast difference in time?seems so extreme. Mahāyāna etc., are paths of renunciation. Vajrayāna is a path of non-renunciation. Mahāyāna has no special methods. Vajrayāna is the vehicle of methods. Mahāyāna has no system of coordinating the basis, the five aggregates, with the result. Vajrayāna is the vehicle with the basis, the five aggregates is coordinated with the result through the empowerment rites. Mahāyāna is a causal vehicle in that they practice creating the causes for awakening for three incalculable eons or more, i.e. the cause is taken as the path. Vajrayāna is the resultant vehicle because here, the result, the three kāyas, is take as the path. Mahāyāna and so on are for people of lower intelligence. Vajrayāna is for people of sharper intelligence. Mahāyāna is for people who have less afflictions and can easily give up desires and so on. Vajrayāna is for people who are highly afflicted and cannot easily give up desires and so on. Mahāyana is the practice for past ages when the five degenerations were not so rampant. Vajrayāna is the practice for this age, when the five degenerations are very rampant. And so on. These are the usual reasons given in Vajrayāna texts. I'd love if you could explain to me, if you follow Yogacara philosophy how can Vajrayana be a quick path? Supposedly it takes 3 aeons to extirpate the seeds, so how does it work? rory wrote: I'd love if you could explain to me, if you follow Yogacara philosophy how can Vajrayana be a quick path? Supposedly it takes 3 aeons to extirpate the seeds, so how does it work? Who said i follow Yogacara? Certainly not me. Well I didnt ask you particularly Malcolm but as far as I know Tibetan Buddhism follows Yogacara or Mahdyamaka philosophy, so I'd assume you at least know even if you don't follow it. Similarly I try and understand the various philosophical schools: Yogacara,, Tiantai, Avatamsaka in East Asian Buddhism. 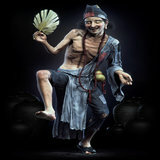 MN 10 wrote: ..Let alone half a month, bhikkhus. If anyone should develop these four foundations of mindfulness in such a way for seven days, one of two fruits could be expected for him: either final knowledge here and now, or if there is a trace of clinging left, non-return. So the point is that the OP question is sort of like asking which martial art is the best to make one a grand champion: judo, taekwondo, karate, kung fu, etc.? And the answer is that it's not the art, it's how much energy and effort one puts into practicing it. Similarly, the fastest way to buddhahood depends on the time and energy one puts into cultivating his virtues, meditation, and development of insight. If one is morally corrupt, lazy on meditation and cultivation of insight, no matter what path s/he picks, Theravada, Pure Land, Vajrayana, etc..s/he still gets a long way to reach the end goal. Except that's not talking about buddhahood. Though I've read some arguments to the effect that in the earliest strata of texts there's not a differentiantion made between arhathood and buddhahood, by the time of the typical Theravada, then yes certainly they do make the distinction in their texts. For instance in the Nidānakathā which is about our current Buddha, it's pretty similar to the Mahāyāna version where first he, as Sumedha, makes a vow to become a buddha and then takes many births before achieving buddhahood. The quick path depends on you not advertisement. Mahāyāna is a causal vehicle in that they practice creating the causes for awakening for three or more, i.e. the cause is taken as the path. I agree with you on this. If more Vajrayana practitioners were really practicing they would be getting attainments. However, most people are not able to maintain samaya well enough or bring forth the steady intensive practice over a long period necessary for significant progress. Fundamentally, speaking, according to Vajrayāna texts, the extraordinary difference in time is due to the fact that Vajrayāna pratices uses the body as the vehicle for liberation, as well as other special methods, that allow a very serious practitioner to gather the two accumulations that normally require three eons in a single lifetime. I am somewhat confused with this idea of reaching Buddhahood in this very lifetime: I've learned that part of Vajrayana is taking the Bodhisattva vows, where we pledge to *not* take up Buddhahood asap but to postpone it until all beings all liberated. If this is so, how does it fit in with the fast path to Buddhahood? Or is it the case that Vajrayana is not always a Bodhisatva-based approach? Let yourself become that space that welcomes any experience without judgement. saraswati wrote: I am somewhat confused with this idea of reaching Buddhahood in this very lifetime: I've learned that part of Vajrayana is taking the Bodhisattva vows, where we pledge to *not* take up Buddhahood asap but to postpone it until all beings all liberated. If this is so, how does it fit in with the fast path to Buddhahood? Or is it the case that Vajrayana is not always a Bodhisatva-based approach? There are three different types of bodhisattva vows: like a king, like a captain, and like a shepherd. The king-like bodhisattva vow involves the wish to achieve buddhahood as soon as possible, in order to guide others to that state, like a king ruling a country. The captain-like bodhisattva vow involves the wish to achieve buddhahood at the same time as all other sentient beings, like a captain arriving in port at the same time as his passengers. The shepherd-like bodhisattva vow involves attaining buddhahood only after all sentient beings have attained buddhahood, like a shepherd who only rests after his flock is safely penned for the night. Vajrayāna uses the first of these. In other words, our bodhisattva vow states " May I attain the state of Buddhahood in order to place all other sentient beings in that state." Ah, thank you very much Malcolm. saraswati wrote: Ah, thank you very much Malcolm. Yes they do. The shepherd-like vow is considered the most superior, but the king-like vow the most practical. rory wrote: Well I didnt ask you particularly Malcolm but as far as I know Tibetan Buddhism follows Yogacara or Mahdyamaka philosophy, so I'd assume you at least know even if you don't follow it. Similarly I try and understand the various philosophical schools: Yogacara,, Tiantai, Avatamsaka in East Asian Buddhism. It's safe to say Malcolm knows a thing or two about Madhyamika.